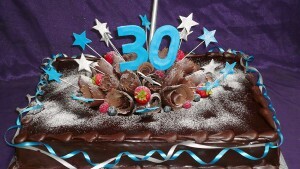 A selection of our cakes are available in larger sizes, ideal for birthdays and larger celebrations. A moist rich chocolate cake with layers of silky smooth salted caramel buttercream icing, drizzled with our chocolate ganache and a salted caramel sauce. Moist raspberry drenched chocolate cake layered with chocolate ganache and raspberries. White chocolate and Baileys liqueur mousse with cherries between layers of moist chocolate cake. Finished in fresh cream and white chocolate flakes. Layers of decadent chocolate mousse sandwiched between layers of liqueur soaked chocolate cake. Covered in fresh cream and dark chocolate flakes. A raspberry drenched red velvet chocolate cake layered with vanilla cream cheese icing and raspberries. A decadently rich chocolate cake with layers of dark chocolate ganache icing made with Whittaker’s 72% dark Ghana chocolate. An absolute chocolate lovers dream!! An old fashioned favourite. A moist banana cake layered with a salted caramel cream, finished with chocolate flakes and caramel drizzle. Spicy moist cake, filled with walnuts and covered in a velvety lemon cream cheese icing. A heavenly moist lemon cake with layers of zingy lemon buttercream and lemon curd preserve. A moist caramel mud cake with creamy caramel sauce. Garnished with salted caramel popcorn and caramilk chocolate. Serve warm with ice cream for a decadent treat!